Outdoor exercise can be enjoyable any time of year! 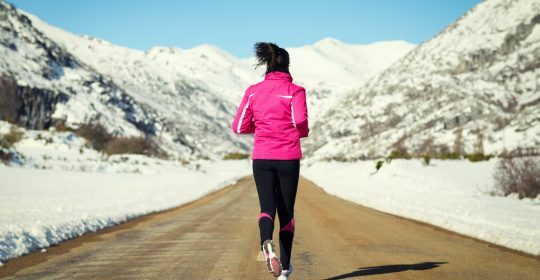 One of the big reasons people tend to avoid exercising outdoors during the winter months is because they are afraid of the cold weather. Don’t let the wintry conditions keep you from staying active this season; learn how to prepare! The best way to stay comfortable during outdoor activities in the winter is to dress inlayers. Layering clothing allows your body to regulate temperature more easily by keeping moisture away from your skin so you stay warm and dry, even after you start to sweat! There are three main layers that you should have on when participating in outdoor exercise. This layer includes undergarments, socks, and those clothes that are in direct contact with the skin. The primary goal of this layer is to keep you dry. Moisture wicking material is recommended for this layer as it assists the movement of sweat away from your skin via a capillary-like system woven within the fabric. The sweat is transferred to the exterior of the shirt for evaporation. You may be asking yourself: what fabrics wick away moisture? Typically polyester or a polyester blend (such as nylon, spandex, and/or polypropylene) is a great material to use for a base layer due to their quick drying nature. Merino wool is another great base layer option. Wool offers an added level of warmth which will be helpful for insulation during the winter workouts. Be sure to avoid the use of cotton as your base layer! Cotton absorbs sweat and keeps the moisture close to your skin which can leave you feeling wet and chilly. *Remember: You still sweat when exercising outdoors in the winter! It’s important to stay dry to avoid cold-related illnesses such as hypothermia. The goal of this layer is insulation. Air becomes trapped between the layers which provides warmth and protects your body from the outdoor temperatures. This layer should fit more loosely than the base layer. The thickness of this layer depends on the level and type of exercise. As a rule of thumb, the higher the level of activity, the thinner the mid layer should be. Fleece, wool, and polyester are the best options for this layer. This is the protective layer. It is meant to shield your body from wind, rain, and snow to keep your body warm in wintry conditions. However, this layer also needs to be breathable so perspiration is able to escape. Similar to the mid layer, the thickness of the outer layer is dependent upon the type of activity. Most importantly, the outer layer needs to fit comfortably over the base layer and the mid layer without restricting movement. During your exercise, add or remove these layers as needed to adjust your temperature control. Proper layering your workout gear when exercising outside will keep you warm, dry, and safe this winter!